Ciaron O’Reilly speaks about Bradley Manning, Julian Assange, detention, torture, over 20 years of war on Iraq and the need for those who marched in 2003 to show their solidarity. The vigil outside the Ecuadorian Embassy continues daily, currently running from 3pm-6pm, or whenever you can get there. Since April 2010, WikiLeaks have released The Collateral Murder video, The Afghan War Diaries, The Iraq War Logs, The Guantanamo Files and Cablegate. The information in these leaks have showed us the reality of the wars in Iraq and Afghanistan (murder/torture/destruction) and also the true nature of our governments and the dirty deals they make. On 30 May 2012, Julian Assange lost his appeal against extradition to Sweden despite not having been charged with any offence. Within two days US Secretary of State Hillary Clinton visited Sweden in a highly unusual move that was not announced until the date of the extradition ruling was known a week before. What was she discussing? US politicians have been calling for the assassination/execution of Julian Assange. On Tuesday 19 June, Julian Assange walked into the Ecuadorian Embassy to seek political asylum. Assange believes that if he were to comply with his extradition to Sweden he would be handed over to the United States. He is seeking the protection of the Ecuadorian people. On Thursday 16 August, Julian Assange was granted asylum by the Ecuadorian government. He remains in the Ecuadorian Embassy which is guarded 24/7 by SO6 Diplomatic Protection Group, Metropolitan Police. Since Wednesday 20 June, a vigil has been held daily outside the Ecuadorian Embassy. The people gathered there stand in solidarity with Assange, a persecuted war resister. They also stand in support of the Ecuadorian people and their courage in granting Julian asylum. If you are in London, why not drop by the vigil and stand for Assange? Embassy address: Flat 3B, 3 Hans Crescent, London SW1X 0LS. Contact number for vigil: Mobile 07 866 559 312 . 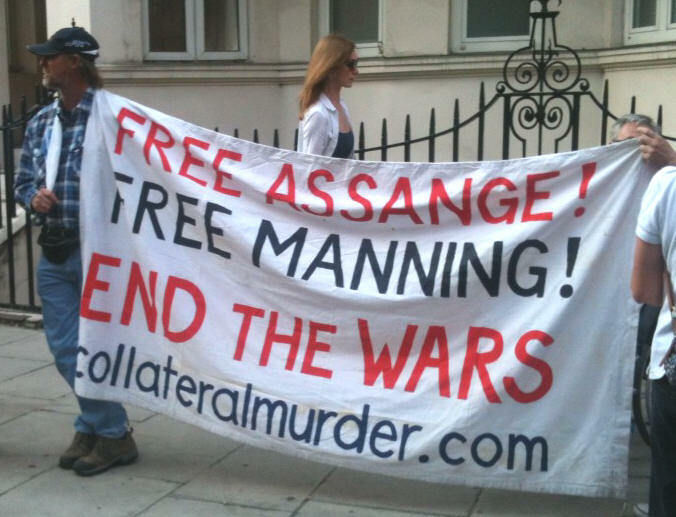 Gallery | This entry was posted in Announcements, Assange, Manning and tagged anti-militarism, anti-war, Australia, Bradley Manning, Britain, Ecuadorian Embassy, Julian Assange, London, solidarity, Veterans for Peace, vigil. Bookmark the permalink. Reblogged this on Isle too.